Tie and Dye work, famously known as Bandhani, is one of such handicrafts that made Gujarat one of the famous travel destinations of India. Bandhani, the Sanskrit work, defines tying the knot. 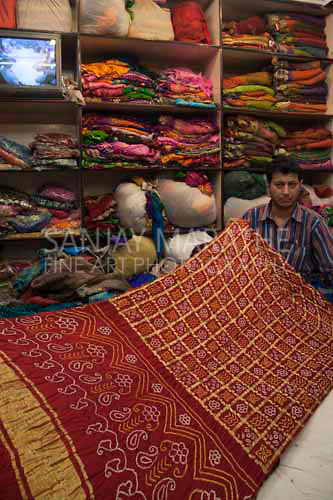 Artisans tie the fabrics and dye them with vibrant colours. Saree, Dupatta, Salwar suits, Dress Materials and lot more other apparel are found across the state of Gujarat that has Bandhani or tie and dye work. Tie and Dye work needs expert hands. The technique of making a Bandhani dupatta or Saree needs few steps. The piece of cloth is knotted in various places according to the design. Then the knotted cloth dips into the colours for dying. This is done by hands only. Once the dying process is over, they untie the cloths to check whether the colour distribution is made properly or not. The designs are made by small dots which are appeared due to knotting and dying the piece of cloth. Bandhani print is all about dotted designs. It can be a circle or a square or any geometric shape, but it is always made by dots. Depending on the designs, one can found few patterns of Bandhani prints such as Bavan Baug, Chandrakala, and Shikari. These patterns depend on how the knot is being tied. Now, depending on these patterns, the final styles are being named. The styles are Chadrakhani, Chowkidar, Shikari, Ghar chola, Khombhi, Ambadaal and such. In Gujarati Bandhani, they use a lot of bright colours like red, green, blue, yellow and such. All these colours are natural and no chemical is applied in making such colours. Bnadhani is originated from Rajasthan and Gujarat. You will also find tie and dye work in Rajasthan as well, but the best part in Gujarati Bandhani is they use vivacious colours and designs that no other state does. Ahmadabad, Jamnagar and Kutch are the famous travel spots in Gujarat where you will find a huge industry of Bandhani prints. Inhabitants of these places have different beliefs about Bandhani. 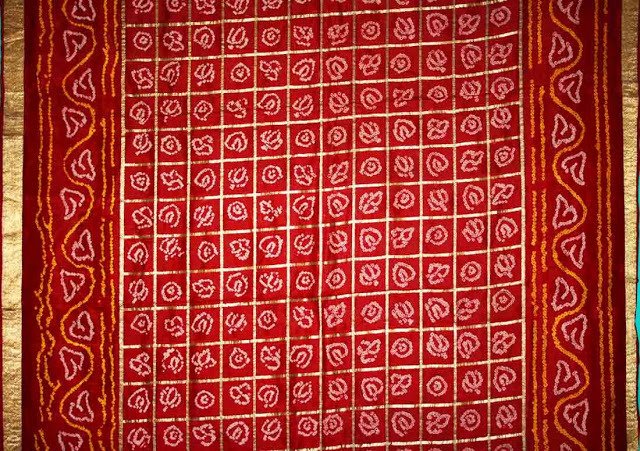 Bandhani prints are hugely used in wedding ceremonies where red coloured saree or suit is used as bridal wear. They believe that wearing red coloured bandhani will bring happiness and good luck. Bandhani is one of the most popular ethnic styles in India. Of course the style is immensely popular in Gujarat as well. Gujarat tourism department has encouraged this handicraft to attract more travellers to the state.